Presidents' Day is typically associated with two titans of the American presidency  George Washington and Abraham Lincoln. But what of the lesser men who have passed through the Oval Office? TIME stops to remember 10 of the 44 Presidents whom history typically leaves out. The original Warren G is widely considered one of the country's worst Presidents. Harding was an Ohio newspaper publisher who eventually rose to become U.S. Senator; he preferred poker, socializing and, it was said, womanizing to working. 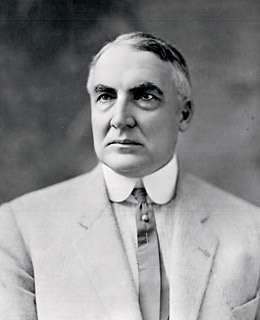 Republican bosses favored Harding, however, finding him charismatic and pliant, and he won the presidency in 1920 promising to restore preWorld War I "normalcy" (his mangling of the word normality was ridiculed by critics). In office, Harding appointed a slew of corrupt officials, prompting the Teapot Dome bribery scandal, which for the first time sent a Cabinet secretary to prison. An accused adulterer, Harding was the subject of a best-selling memoir by a woman who claimed to be his mistress and the mother of his illegitimate daughter. Harding died in office. He lives on partly as a cautionary tale told by author Malcolm Gladwell. In his book Blink, Gladwell says the "Warren Harding error" led supporters to assume he'd be a good President simply because he appeared stately and presidential. It didn't quite work out that way. See rare pictures of JFK's campaign for the presidency.